What concepts could possibly be left in the micro-niche that is iPhone accessories? There’s not really anywhere to go with protective cases, and it’s apparently impossible to create portable speakers that don’t sound terrible. 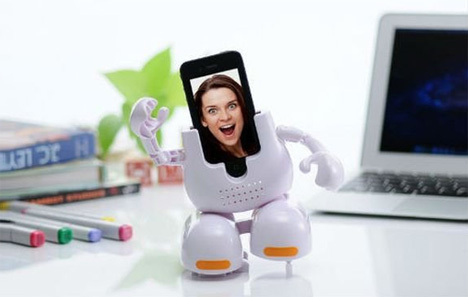 Enter the Dancing Face Stand from Japanese gadgeteers Tomy. 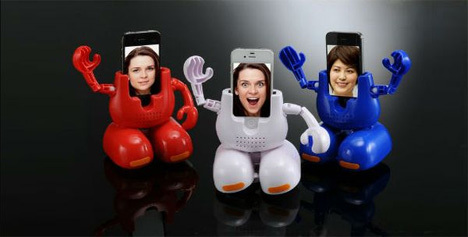 It’s a little half-robot that holds your iPhone 4/4s or 5 which, with your picture displayed, is situated to look like the robot’s face. It gets better when you turn your music on, as the little guy starts to boogie to your favorite tunes. Watching the demonstration video for the Dancing Face Stand is pretty underwhelming. It’ll make your cubicle a little more fun, but the robot’s movements are limited and it doesn’t serve any purpose other than making your iPhone look cute, which we’re pretty sure you’ve got covered by doing this.